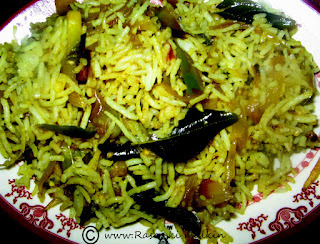 Vangibhath is a special made with brinjals,mainly by karnataka people.Aless spicy food is very tasty enough. Place a pan on the stove add oil or ghee to it. After heating add mustard seeds ,urad and channadaal ,red chilli slits,and after they pop up,add curry leaves.Next add ginger garlic paste,green chilli slits ,haldhi ,and onion pieces.Saute well in low fire for a few say 3 to 4 min.Then add chopped brinjal slits,and fry on a low flame,till the brinjals become tender and cooked. Lastly add salt and switch off. For spicy powder: Next roast dhania ,jeera and cloves& cinnamon and powder it and kep aside. Now mix cooked rice along with brinjal curry well.It should be mixed well thoroughly. Lastly sprinkle the spicy powder on the vangi bhath and mix well. Serve in a serving bowl. Serve hot.